The memorial is dedicated to Rutherford County soldiers killed in action or dying of disease during the Great War. The granite plaque is 36 inches by 36 inches square and 3 inches high resting on a two tier concrete base. The lower tier slanted, being 60 inches by 60 inches square, 11 inches high in the front and rising to 22 inches in the rear. The second tier is 36 inches by 36 inches square and 12 inches high. Eight decorative black steel posts approximately 2 feet tall linked by a steel chain frame the monument. 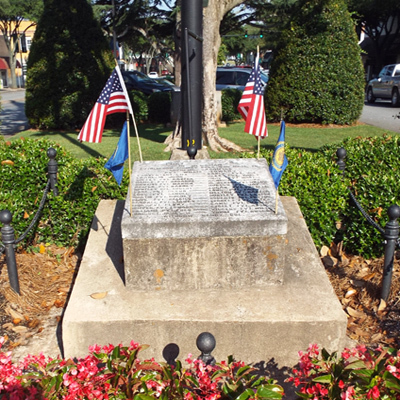 The monument sits in front of an 87 feet tall flag pole which along with the memorial site itself was dedicated in 1922 two years prior to the plaque. Private Willis Towery for whom American Legion Post 74 is named in honor is the first of 34 names listed. It appears there was an effort to list names alphabetically, but this falls off as one reads down the list. Rank is shown for all but three of those listed. Two names are misspelled. Barney Hopper is spelled as Barney Hooper and Charlie Sane is spelled as Charlie Same. One African American soldier’s name appears at the bottom and is designated with the abbreviation COL. News articles and a published list state 33 names appear on the plaque. The 34th name of Sgt. James W. Long was added in October, 1929. AMERICAN LEGION / POST 74 / IN MEMORIAN / RUTHERFORD COUNTY BOYS WHO MADE THE / SUPREME SACRIFICE / PVT. WILLIS TOWERY / CARVER SGT. LOX – EARLY PVT. JOE / FRANKLIN JOHN – GEER PVT. YATES / GUFFEY PVT. BAXTER – GRAY PVT. MARTIN / HAMES PVT. BROADUS – HAMRICK BROADUS / HAWKINS PVT. MARION – HENDERSON PVT. WILLIAM / HOOPER PVT. BARNEY – HUDSON PVT. JAY / HUNTLEY CPL. ROBERT – LOGAN PVT. RUSSELL / LANE PVT. HELON – LONG PVT. FAY / LONG PVT. SAMUEL – MELTON PVT. BAXTER / MARTIN PVT. HUGHEY – HUNTLEY PVT. LAXTON / PRICE PVT. RALEIGH – ROBERTS SGT. FESTUS / RANDALL PVT. STAMEY – SORRELS PVT. YATES / SISK PVT. PERRY – SAME PVT. CHARLES / SKIPPER PVT. EDWARD – STREET PVT. ADDIE / WILLIAMS PVT. FRED – VICKERS PVT. WILL / LONG SGT. JAMES W. – YOUNT PVT. ROSCOE / WITHROW HENRY COL. 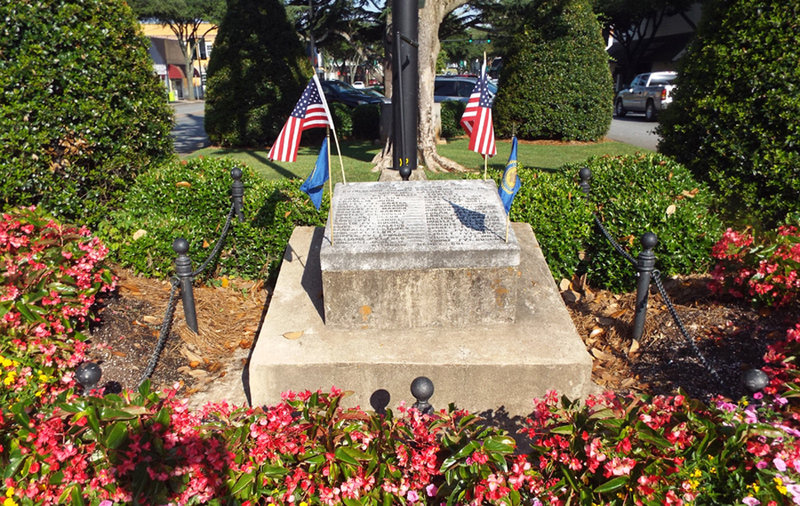 The flag pole and concrete base for the plaque were dedicated on November 11, 1922 before a crowd estimated at 6,000 people. Day long activities were interspersed with a parade led by the Haynes Band of Cliffside, NC leading a group of soldiers and school children to the town square. The Star Spangled Banner was played as the flag was raised for the first time. Dr. R.J. Bateman, pastor of First Baptist Church in Asheville delivered the address described as one of the best ever given in Forest City. The plaque dedication was held two years later on November 11, 1924. A crowd estimated at 5,000 people attended a full day of events that began with a concert by the Cliffside Band and athletic events throughout the morning. At 11 AM a parade led by the Haynes Band marched to the public square for the featured address of the day. Former US Congressman Clyde R. Hoey of Shelby was scheduled but unable to attend and was replaced by Rev. W.A. Ayers. This speech was followed by dinner and then the unveiling ceremony. The dedication speech was given by Dr. Charles H. Stevens, pastor of First Baptist Church in Cliffside and a prayer by Dr. E.V. Hudson. The flag used to cover the monument prior to unveiling had draped the coffin of Private Laxton Huntley upon the return of his body from France. Afternoon activities continued with a high school football game, boxing and a baby contest and the movie “Birth Of A Nation” was shown throughout the day. Veterans from three wars that included 214 from World War I, 17 from the Civil War and 2 from the Spanish American War were fed dinner which was followed by fireworks. The day ended with a parade of approximately 150 members of the Ku Klux Klan dressed in full uniform of the order. A Forest City Courier news article from November 12, 1924 claims this was the first monument in Rutherford County dedicated to World War One. A monument to those who served from Rutherford County and Cleveland County but located in Hollis in Rutherford County was dedicated on July 4th, 1921. The monument sits in the median that divides East and West Main Streets near the intersection of Mill Street in what was once the public square as described in newspaper accounts and shown on Sanborn map of 1916. The memorial faces east. Nearby and also in the median, the Forest City Confederate Memorial, and a monument to law enforcement officers killed in the line of duty. The monument is flanked by sculpted bushes with mature trees further behind. This landscape feature is rectangular accept for the east end which is rounded. The west facing side contains a granite monument dedicated to three law officers killed in the line of duty. Parking spaces interrupt the median at this point but further west is another landscape feature in which sits the marker for the Burnt Chimney Muster Grounds which were used from 1861 to 1865. Two and three story buildings line both sides of the street.